Paddling on these Canoe and Kayak trails is an excellent way to see all the beauty of this unique East Texas Lake. A pleasurable slow cruise through the Cypress trees dripping with Spanish moss is a personal journey enveloped by nature. While Snowy Egrets and Great Blue Herons fly overhead all the while beavers and fish try to hide from view. Depending on the time of year you’ll see beautiful lotus blossoms floating atop their bright green pads or you might see their distinctive seed pods standing tall above the waves. With 10 paddling trails equaling over 50 miles of marked kayak and canoe trails on Caddo Lake and the Big Cypress Bayou you will find more bayous, swamps and sloughs to bring you back over and over just to see more. Please make sure to abide by the water rules of safety while you’re having fun. There are quite a few places to put your kayak or canoe in the water. This year they put up some really nice colorful markers that are easy to see clearly so you can paddle around and know where you are. Listed below are the access sites to begin your adventure to the canoe and kayak trails around Caddo Lake and the Big Cypress Bayou. To learn about these trails please visit the Texas Parks & Wildlife Paddling Trails website. While planning your paddling excursion make sure to spend the night in Jefferson Texas at the White Oak Manor B & B, that way you can get a good night’s sleep and a delicious breakfast the next morning. 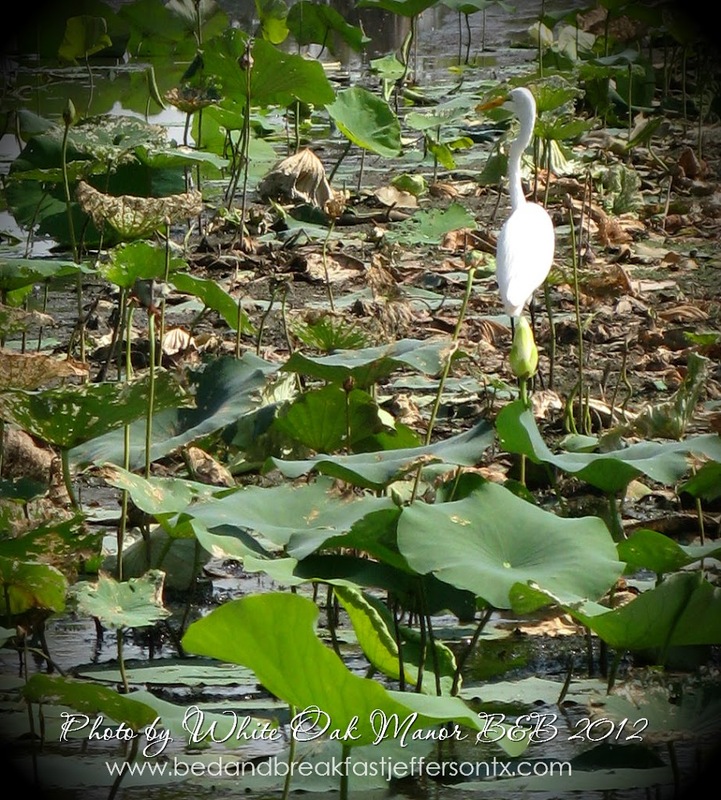 This entry was posted in Summer Events, Wildlife by Tammy D. Bookmark the permalink.